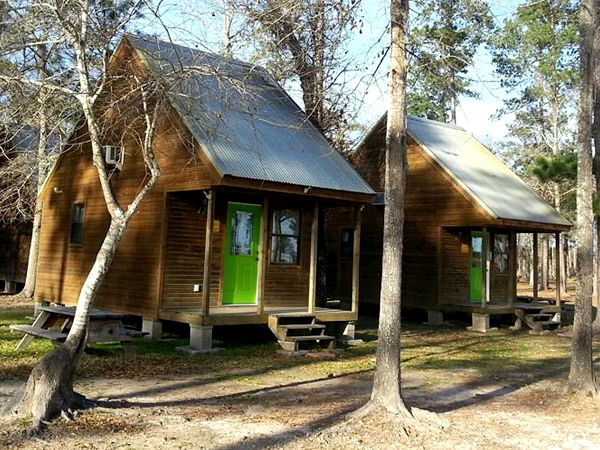 Our Camping Cabins are furnished with 2 full sized beds and A/C, and you bring everything else. Bathrooms are located within walking distance. A family of 4 can enjoy one of these. This price includes use of our swimming pool, Water Zone, canoes, and mini golf. Our Deluxe Cabins have a bathroom with a shower; a kitchenette with a 2 burner stove, refrigerator and sink; 1 full sized bed; a futon couch; heat and A/C. You just need to bring pillows, linens, towels, cooking and eating utensils, and toiletries. Up to 5 people can sleep in this cabin. Prices are based on 2 adults and dependents, and extra adults are $10 each per night. You can play all day in our swimming pool, Water Zone, canoes, and mini golf. If you have up to 8 people in your camping group, our Deluxe Cabin With Loft will sleep 4 people comfortably in one full sized bed, and one futon couch, and sleeping bags can be spread out in the empty loft. 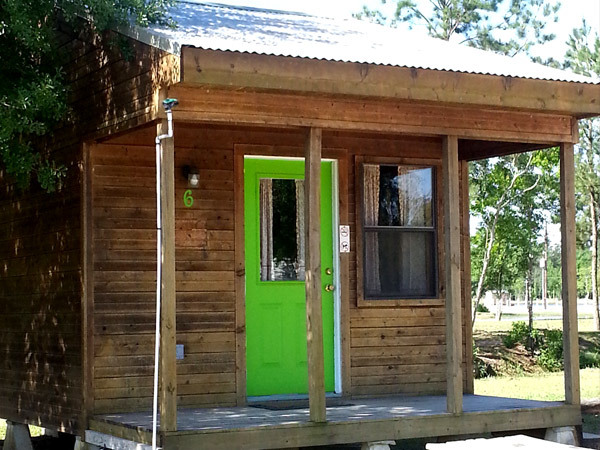 This cabin has heat and A/C, a bathroom with shower, a small refrigerator, and a microwave. You just need to bring pillows, linens, towels, cooking and eating utensils, and toiletries. Check our rates page for more information. You can add adults for $10 per night, per person, plus tax. All of our amenities are included: Water Zone, swimming pool, canoes, and mini-golf! 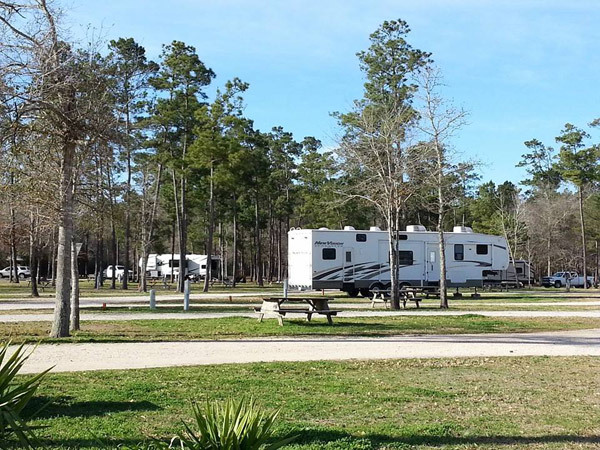 Our spacious back-in or pull-thru RV sites have water and sewer hookups and 30/50 amp electric service. All of our amenities are included in the price of your campsite. 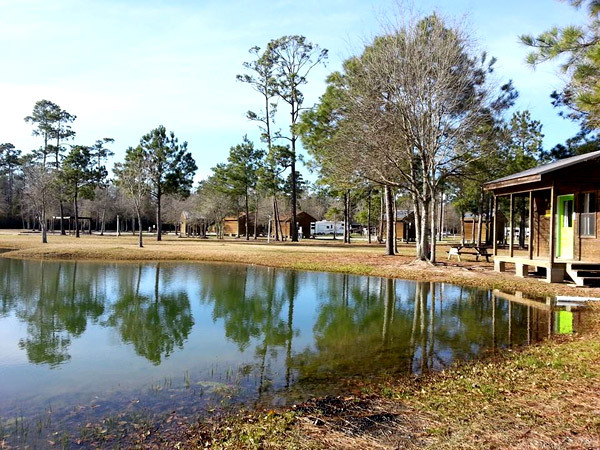 Check out our great rates for our superior campsites and cabins in Lake Charles, LA. Rates include all park amenities. We offer overnight, weekly, and monthly rates. Come stay with us, whether you are passing through, playing for a weekend, or staying for a while. Campsites or 3 sizes of cabins are available to accommodate you. We offer you a variety of high level amenities and facilities for your enjoyment. Whether you are on family vacation or relaxing after work, you can play here as well as stay here.